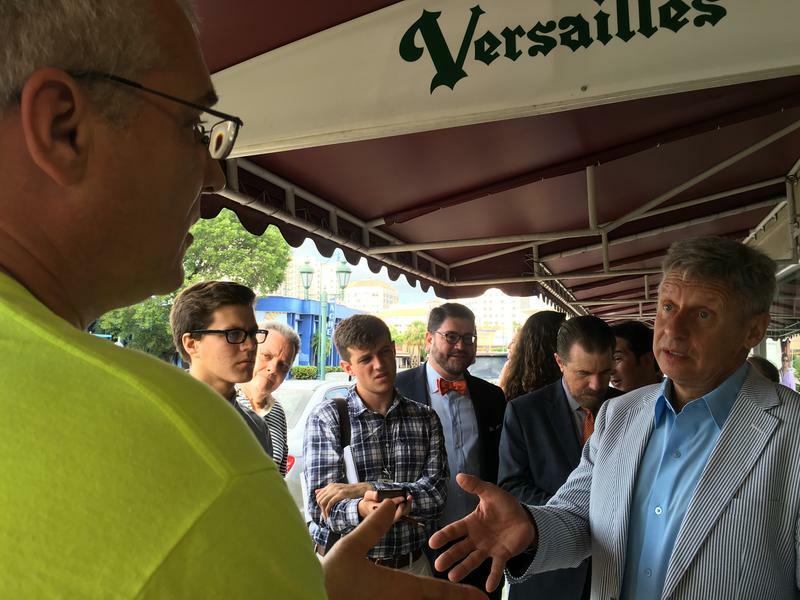 Audio report about Gary Johnson's visit to the Versailles. Johnson was surrounded by about 20 people, some of them supporters, and a dozen journalists. He said: "I applaud what [President] Obama has done. I understand the hard feelings inside the Cuban-American community. All that said: Offering free trade that is how Cuba will change for the better." Manuel Huerta was out to get his morning coffee at Versailles. He has been living in Miami since 1961 and didn’t agree with all Johnson had to say about Cuba. But he found other aspects of Johnson's remarks like taxes and foreign policy interesting. "I'm listening in. I'm a registered Republican, but I like what he has to say," Huerta said while smoking a cigar. "We have the two most awful candidates in Hillary Clinton and Donald Trump and I am looking for someone I can actually vote for," Huerta went on to say. He said for the first time since being allowed to vote in the U.S. he didn't feel like it at all. "That's sad." Johnson, a former governor of New Mexico, tried to conduct the interviews and talks with voters inside the Versailles restaurant, but the manager on-site said no permission had been granted to film inside. So Johnson went back outside and continued interviews at the coffee counter. "This Cuban coffee is so strong. It would really be useful in the presidential debates," Johnson said. "That's all you need to be unstoppable." However, it is still unclear if Johnson will be allowed to take part in the debates. He would need a 15 percent showing in polls. And that is a hurdle no third-party candidate has overcome since the commission set the bar in the 2000 campaign. "If I will make it to the debate, everything is possible in this crazy election cycle,'' Johnson said.